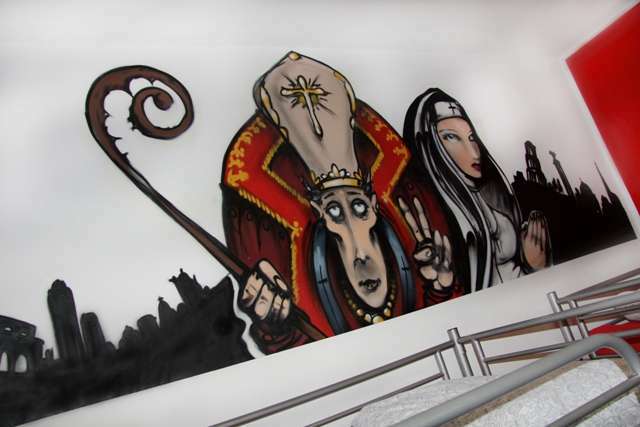 Graffiti Hostel is located just a few blocks away from La Sagrada Familia It's the perfect place for people looking to enjoy themselves and have some fun! The hostel is large, clean and comfortable and just 10 minutes away from the majority of Barcelona's biggest attractions. The closest Metro station is Encants only 15 minutes from the city centre and 5 minutes from the Sagrada Familia. Our property has bathrooms, spacious showers, dormitories, air-conditioned common spaces, reception and overall elaboration in guest service. Profesional artists from Germany, U.K, and other parts of the globe have combined ideas and artistic experience to provide professional graffiti pertaining to Barcelona, Spain, and other European cities. The hostel has been decorated exactly as the name implies: with graffiti. The different styled rooms are London, Berlin, Rome, Gracia, Rambla, and Sagrada Familia. London and Berlin both have a capacity to accommodate up to 10 people while the rest have capacities of 8 people. All rooms have balconies overlooking the main street and safety lockers. In addition to our laundry service we also rent blankets and towels. We have communal computers along with Wi-Fi accessible from all areas of the hostel both are free of charge for all guests. These are just a few features that make Graffiti Hostel the ideal place for your visit. If you have any questions or would like to make a reservation, we would be happy to hear from you. Cancellation Policy: All cancellations must be made by e-mail only. On receipt of Cancellation e-mail a confirmation of cancellation will be sent to e-mail given at time of booking. Telephone cancellations will NOT be accepted. If you wish to cancel or alter your reservation, 24 hours' notice must be given. Guests can still use common area facilities for a reasonable amount of time after Check-Out if city departures are later than check-Out. We also offer free luggage storage to all guests. We only accept guests between the ages of 16 and 40 in our dormitories. Guests under the age of 18 must be accompanied by an adult. Our private rooms do not have a maximum age limit. Please note: a tourist tax of 0.75c per person per night will apply for the first 7 nights. Tourist tax is NOT included in price of reservation and is to be paid at lodging establishment on arrival. Check-out: 11:00am - after this time a full day will be charged.